February is Helen’s month. 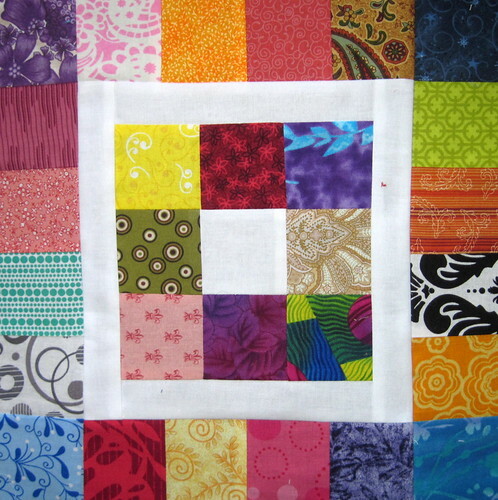 She requested Patchwork Square in a Square Blocks from The Sometimes Crafter blog. This is a nice simple block, especially since I’ve a bunch of my scraps pre-cut into 2.5″ squares, so I was determined to finish this early this month. I want to get all of my blocks sent out, since I’m woefully behind on that. Helen asked us to pick at least one 2.5″ square of fabric that we felt symbolized us, and to tell the rest of the group why we chose the square and what the fabric meant to us. 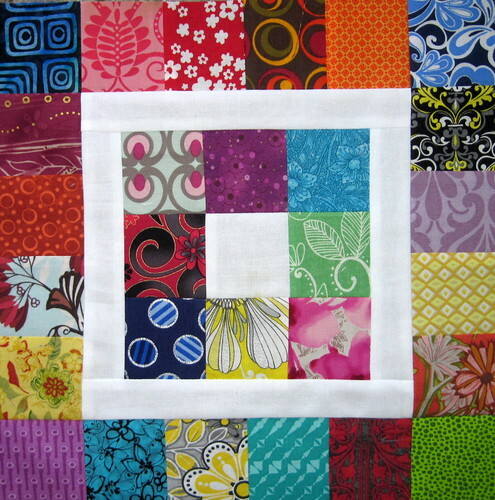 In this block, I included a couple of very favorite fabrics that I just had to have. The pink and white fabric in the top row is a Day of the Dead print by Alexander Henry. The fabric in the lower right corner of the inner square is another fabric that I couldn’t live without. Here, I added a couple of patches from the Eclipse line by Exclusively Quilters. This was the first (and last) fabric line that made me buy nearly all of the fabrics in it. This was a major learning experience for me, as I sat on the fabric for the better part of two years, because I just didn’t know what to do with it. I would look at the fabrics together, and just feel my creativity so limited by the matchy-matchiness of the fabrics. It was only by collecting several grey and yellow fabrics for the Botanical BOM that I was able to break free of my mental block. It’s a good start to February, to be able to check off an item of my to-do list. Tonight, I’ll package all of the swap blocks to be sent out, and that’ll be another item off the list. I’m also hoping to plan the next row in the Farmer’s Wife sampler, or perhaps work on the Test Your Skills Sampler. It all depends on kiddo and how easily he hits the hay at bedtime. Thanks Jeanne, I love both these blocks and the stories behind them.. I can relate so much to loving a line that much you just don’t know where to start and I can see why you love that eclipse line, it is just gorgeous! Thank you again so much for sharing your story and these blocks with me! The white really makes the block pop! Love how it works with everything else. What a nice project. The quilt will be awesome when it is completed. I do hope she shares pictures that you can post on the blog.